This article details how Field59’s hardware encoders send video streams to our live stream platform. 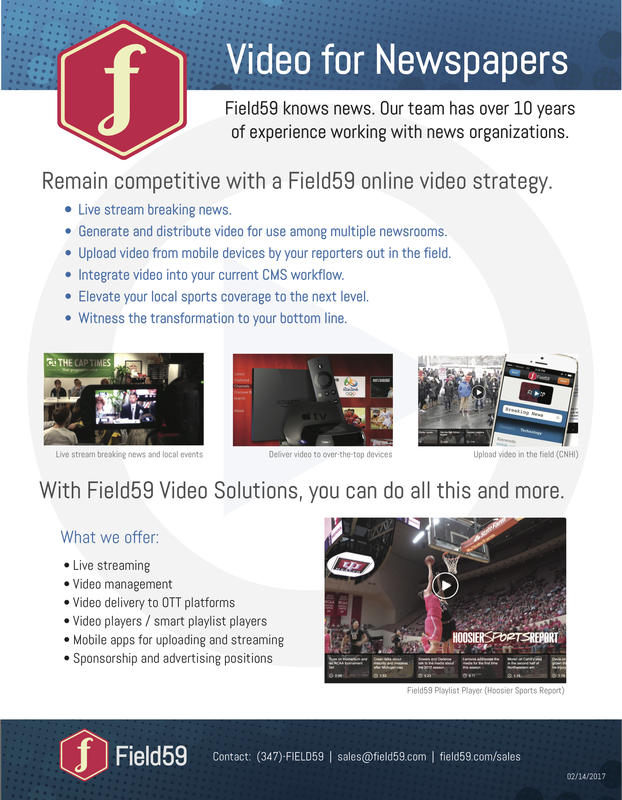 Field59’s video platform works with any third-party hardware or software encoder that can send video and audio to our platform via RTMP (or alternatively RTP/RTSP) in formats (for video, h.264; for audio, AAC or certain MP3 recipes) that can be ingested by our live platform. In fact, Field59 now uses and recommends hardware from Teradek for closed-captioned live streams. We are happy to provide your organization with an encoder for license or purchase. The form factor is a large rack mount. If your video input contains embedded broadcast closed captions, our encoder can automatically convert those to web closed captions and include in the live stream. If live streaming will be done on a fixed location and on a regular basis and there is an appropriate place to “install” the server such as a server rack, you may prefer our hardware encoders. This includes but is not necessarily limited to: broadcast TV stations, schools, hospitals, conference rooms. If you’d like Field59 to support your encoder should technical issues arise. Field59 encoders accept SDI audio/video input. Please see the Teradek Slice Specs for full technical information on our encoders. The servers are connected via Ethernet. Monitor is recommended, but not required. The Slice offers a web graphical user interface (GUI). If you order through us, Field59 is happy to pre-configure with your appropriate network settings so that the device is plug-and-play when it installs. Once the hardware is installed and operational, and you send a video feed to it, our platform will begin to receive your live stream. If you are using the Field59 video platform, the stream will appear in the player for any active Live Events (or Live Channels if the channel player contains an active Live Event) that you have configured using the stream.